We are pleased to announce that the Hicks Lodge Cycle Centre project completed by Robert Woodhead for the Forestry Commission has won the Small Scheme of the Year Award in the ProCon Leicestershire Awards 2011.These awards celebrate the excellence and dynamism of the property and construction industries in Leicestershire and are sponsored by the Leicester Mercury. The site was reclaimed from open cast mining and the new build forms a hub for cycle enthusiasts, providing high quality facilities and accommodating for all their cycling needs in a custom built environment. Incorporating Woodhead’s knowledge of green technologies, Hicks Lodge utilises sustainable timber throughout, solar panels, a biomass boiler and a sustainable urban drainage (SUD) system in an airtight structure. These are all design elements which make a significant contribution to sustainable development principles. In fact, only one site skip was used during the build with less than 3% of waste going to landfill. 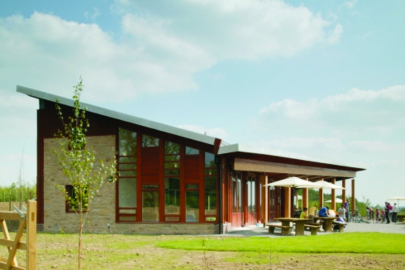 Set in the National Forest the project was designed to BREEAM Excellent standard. Hicks Lodge is not just an exemplar of environmental sustainability but crucially, and on an ongoing basis, it is contributing to a highly sustainable local economy. For more details on the project watch our YouTube video: Hicks Lodge Cycle Centre – An Exemplar Sustainable Building Designed to BREEAM Excellent or check out the written case study: Hicks Lodge Cycle Centre in the National Forest.